This is perhaps the best known database to be found in the pattern recognition literature. 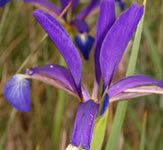 The data set contains 3 classes of 50 instances each, where each class refers to a type of iris plant. One class is linearly separable from the other 2; the latter are NOT linearly separable from each other. This is not a native data set from the KEEL project. It has been obtained from the UCI Machine Learning Repository. The original page where the data set can be found is: http://archive.ics.uci.edu/ml/datasets/Iris.